The October first holiday in China is a celebration of over 65 years since the founding of the People’s Republic of China. 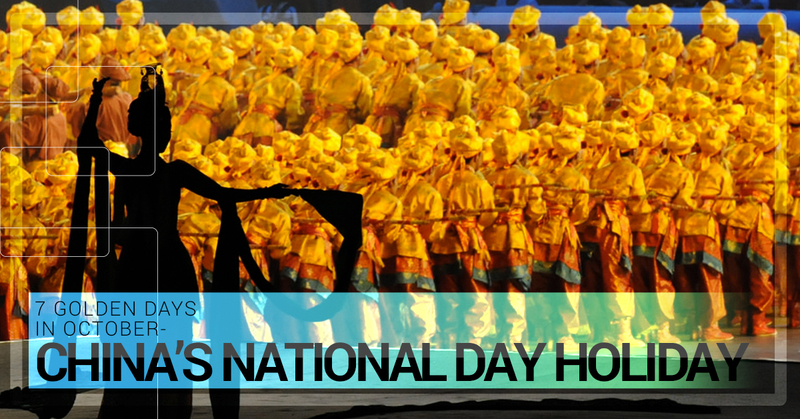 China’s National Day holiday spans 7 days and is also known as one of two “Golden Weeks”. China’s other Golden Week occurs during the Chinese New Year. Golden weeks are a great time to travel and Chinese people are quite lucky as it is rare for countries to allow the entire nation to be off for such a long period of time. Of course, some stores will remain open, but most places do shut down for at least the first three days of the holiday. Tourists spots in China will be packed during this holiday so it is best to travel outside of China if at all possible. However, plane tickets may be higher during this period. The most used form of transportation during Chinese holidays is the train system. You will be lucky if you can find any available train tickets during national holidays. Instead of actually taking the train, you may want to stop by the train station just to take pictures. Watching hundreds of thousands of people all in one place at one time allows for some pretty amazing pictures. As with any Chinese holiday, you should try to spend time with family and eat some good food. If you want a true China experience, go to the hometown of one of your friends during China’s National Day holiday. It may be the first time their city or town has ever had a foreigner visit and can make for a memorable time! Regardless of what you end up doing during China’s National Day holiday, enjoy the time off, do something you don’t normally have time to do, and catch up with those you love. This holiday only comes around once a year so make the most of it.